why cooking with dough re me kids? • You can be assured of quality ingredients used during class. • Small group size fosters sharing, patience, respect for others and cooperation. • Table manners are taught and encouraged. • Repetition of key ingredients aids in recognition. • Math and science are taught as the foundation of recipe making. • Cleanliness is taught, practiced and reinforced. • The children gain confidence and independence in the kitchen. • The learning process goes from garden to plate in the summer months. • Picky eaters will add more foods to their list. • We eat all of our lives and good food habits will be with us forever. It’s never too early to start. At Dough Re Me kids, we use quality ingredients for our classes. We do not prepare items unless we can obtain the necessary ingredients that meet our high standards. In shopping for the class, not only do we strive to obtain organic or greenmarket ingredients, each item is examined for aging and purchased close in time to the class to ensure freshness. Our small classes foster an environment where the students know to “help their neighbor” by holding their bowl while they stir; that with patience, they will all have an opportunity to measure and add an ingredient or crack an egg; by respectfully asking the person across the table to pass an item they will get what they want and that working together produces amazing results. During the class you will hear “please”, “thank you”, “will you pass”, “may I have”… also reinforced are the skills of eating with mouths closed and speaking after eating. We repeat key ingredients so that they will be instantly recognizable. Many basic herbs, garlic, eggs, cheese, olive oil, and flours, are used in a majority of the recipes we prepare. They are identified by sight, smell and taste. In addition, we discuss their various uses in everyday foods we eat. Naturally we use math and science in cooking. The more we use it, the more familiar it becomes. not only do we use kid-friendly measuring cups and spoons, we count the number of eggs in a dozen, determine how many biscuits will fit on a baking sheet and how many each person will get if we divide the dough in two (in four or in eighths). 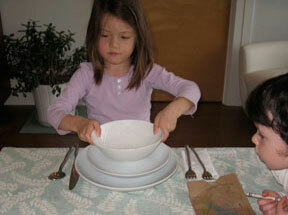 The children are taught the important lesson of cleanliness while preparing food. Naturally, they wash their hands before and during class and if they get bacteria on their hands (say, cough or sneeze) during cooking. Equally important, they are taught not to put items destined for the group into their mouth. Anytime their fingers are in their mouth, the items that are touched afterwards are discarded. A small class size with two teachers, allows us to be as vigilant as necessary. Confidence and independence in the kitchen are the tools that remain with us and enable us to eat healthy throughout our lives. The familiarity that comes with weekly classes provides each student with fearlessness in trying different foods combinations and experimenting until they find what suits their tastes. They are very proud of their creations and look forward to bringing samples home for all to taste. In the summer months, the children can pick various herbs, lettuces, and tomatoes for use in our recipes. They also plant their own herbs from seed to take home and use. This is the foundation of the broader lesson of learning where your food comes from. When picky eaters make something they don’t like, or think they don’t like, they will eat it in class. The combination of making the food and watching their classmates enjoy it, gives picky eaters the courage to try it themselves. Often times, they find they actually enjoy it. Learning to cook is important for everyone, because the reality is that eating is a lifetime necessity. The added bonus of developing these skills in a fun, clean, nurturing environment makes cooking an activity that the children look forward to week after week. Dough Re Me Kids, Inc., was officially formed in July 2008 as a cooking party and instruction business for children and adults. Although the company began in 2008, I have been cooking with children for over 4 years. As happens with many children’s companies, it began when my own child wanted lessons for getting started in the kitchen. My love for cooking had surfaced in my child and I was more than happy to guide her! After teaching in her classes over the years, and giving private instruction to children and adults alike, I offered weekly classes each semester and assistance to adults in hosting cooking parties for themselves and their children. Following many years of working as an attorney, I consider myself lucky to be able to focus on my true passion. I have taken numerous cooking courses in NYC, but my best training came from my family (Armenian) and my husband’s family (Italian). I began cooking with earnest at the age of 7 and can honestly say that it makes me happy to cook, shop, eat and talk about food. I am an avid home cook with tons of experience in the home kitchen. My goal in these lessons is for my students to not just enjoy cooking, but to develop an enthusiasm for the food they eat. Instilling a love for cooking in children is a natural extension of my passion for cooking. Teaching them about food, from beginning to end, is the mission of Dough Re Me Kids. warmth are the key ingredients for her success. I only wish they would share their goodies more!" "My eleven year old son took two workshops with Romy and didn't just come home knowing about vegetables, he came home cooking and EATING them. Romy's hands-on teaching method is a fantastic way to get kids to really care about what they put in their bodies. She makes each class so much and so delicious, to boot!" @ 2013 Dough Re Me kids | email: info@doughremekids.comphotograph : Vandenberk Visual Inc.